The Canadian singer aims to reflect her view of the new post-feminist movement in her new album, Havoc And Bright Lights. Alanis said: "[It's] the whole shifting of the misogynistic, chauvinistic, patriarchal thing into what this new climate is slowly becoming, which is the celebration of the alpha-empowered woman. "There's a new climate that I'm noticing, I don't know if you are, of women just being loved and respected and honoured in a way that even 10 years [ago] I didn't notice." 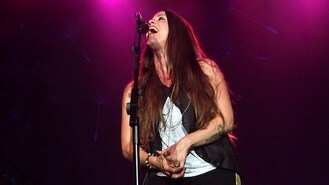 The Grammy-award winning singer also spoke about seeing herself in old videos from her debut album Jagged Little Pill. She said: "I think, 'She's cute - nice hair, she looks a little greasy'. She's like a little sister almost."